Right before the big holiday season picks up, and with Halloween throwing a monkey wrench into the usual patterns, Hollywood essentially is taking a few days off, with two-thirds of a major release, two re-releases and a handful of limited releases making up this runt of a weekend. October 31st is one of those havoc-causing days for box office receipts, for obvious reasons. 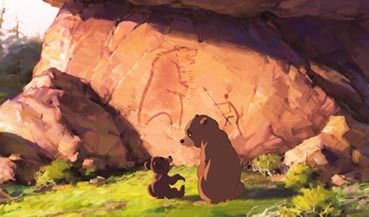 Parties and trick-or-treating take precedence over the less social activity of heading to the movies, so in an attempt to avoid a bloodbath on Friday, Disney is skipping the day altogether for its new release Brother Bear and starting it on Saturday, November 1st. This kind of release pattern is not unprecedented; in 1999 with Christmas Eve (another black hole) falling on a Friday, both The Talented Mr. Ripley and Man on the Moon skipped out on the traditional day of release and opted for opening on Christmas Day. Foregoing a day of proceeds doesn't seem to make much sense, but the last thing studios want is an empty theater on opening day, something they're likely to get with an animated film on the second biggest holiday on the Kid Calendar. The previous dozen or so years had seen Disney as an unmatchable studio for animated films, with a string of hits unparalleled since perhaps the studio's early beginnings. The past couple of years, however, have seen some missteps and chinks in their mighty armor, specifically with the action/sci-fi films like Atlantis and Treasure Planet (the latter failing to break the $40 million mark). Traditional cel animation seems to be on the way out (though there's the small matter of Lilo & Stitch) and the core Disney releases have seemed just so...ordinary (Pixar excluded -- which may in fact be part of the problem). Brother Bear sees a return to the Anthropomorphic Theater that made films like Beauty and the Beast and The Lion King such gigantic hits and maybe is a way to right the Disney ship before it starts to visibly list. Set around the time of the last ice age, Bear is fable-like story of a Native American (voiced by Joaquin Phoenix) transformed into a bear after killing one that killed his brother. A third brother then pursues him as he tries to find a way to become human again. In the meantime, he adopts (or is adopted by) a bear cub. Life lessons and wackiness ensues. Stealing the thunder from the film is the heavy placement of two sidekick characters in the promotional material, voiced by Dave Thomas and Rick Moranis and sounding just a tad bit like their Bob & Doug MacKenzie characters from their SCTV days. It's extremely doubtful that any of the kids in the audience would be familiar with the beer-guzzling, toque-wearing Canucks or their large antlered equivalents, but funny is funny and the most underrated factor in the success of animated films is the parents who may or may not accompany their kids to the movie. If you can squeeze an extra $9-18 out of adult admissions by giving the impression that this movie won't bore adults to tears at (though the Phil Collins songs serve as a great red flag warning sticker to me), then you're that much further ahead. Brother Bear will need all the help it can get to win the weekend outright with only two days to work with; in two days it should still be able to make about $22 million, which would outpace a few of their recent three-day opening weekends. With a regular three-day weekend, it wipes the floor against the second weekend of Scary Movie 3. Even now, it's a close race considering the surprising $48 million Scary 3 started with (great job, everyone, we're going to get to at least six of these things now). Though Scary Movie fell a Spartan 38% in its second weekend in 2000, Scary Movie 2 dropped 53% in its second frame and I see no reason for this trend to break, given the fact that the film is a sequel, not to mention heavily genre influenced and front-loaded. Give this one $20-22 million as it makes it interesting for the top spot. The real horror movie for this weekend is instead the re-release of Alien, the 1979 classic. It is not being shown the same amount of confidence as was given The Exorcist a couple of years back, as a previously planned wide scale release has been pared back to a mere 374 locations and very little media coverage. That's still potentially enough to make some noise box office-wise as The Exorcist managed over $8 million on just 664 screens. Alien has an even more contemporary style to it. In just a limited rollout, however, it will have trouble breaking the $5 million mark. The other re-release barely counts as the film had just recently been pulled. Sony decided to spend a few bucks to have a horror-ish movie out on Halloween weekend by relaunching Underworld in over 1,300 theaters. It didn't take the first time (after a decent opening weekend) and I don't see this minimal push making an difference here; look for a only a couple of million, if that. Yet more horror is available in the form of The Texas Chainsaw Massacre remake (words I never thought I'd find myself typing), which is officially in free fall after a near 50% drop in weekend number two. Having already made $50 million, $75 million could be a real challenge as a milestone. In the Cut makes its wide debut after starting on six screens last weekend; its meager $14,000 per screen average on this low number of locations doesn't scream upcoming box office bonanza; perhaps the idea of Meg Ryan naked (reportedly the only real reason to see this pedestrian thriller) just doesn't have the allure it once did. Maybe if she'd done it between Joe vs. The Volcano and Sleepless in Seattle, there would have been some genuine interest. On around 800 screens, give it $4-5 million for the weekend. Oscar bait extraordinaire The Human Stain debuts in a modest 160 venues, a rather confident ploy rather the usual NY/LA/Toronto release. Starring Anthony Hopkins, Nicole Kidman and Ed Harris and based on the award-winning book by Philip Roth, this is one of those "thrillers" that can be described by a bunch of abstract nouns such as "intrigue," "seduction," "jealousy," etc. This year's equivalent to The Hours in terms of potential prestige and box office, it's going to need a lot of help from critics groups and award ceremonies to break big and also make an impact at the Oscars. Opening this far away from December could prove trouble for this reason. It'll need, at bare minimum, $1.5 million to keep momentum going after this weekend. In milestone country, entering its final weekend before DVD release, Finding Nemo finds itself just under a million shy of The Lord of the Rings: The Two Towers at an outstanding $337 million. There's no chance of it making up that gap this weekend but it'll likely hang on a couple weeks into DVD release (it's still in the weekly top 20 after all) and sneak past it, at least temporarily before the Two Towers special showings coming in December. Pirates of the Caribbean has gone past the $300 million mark, giving Disney two $300 million grossers in the same year for the first time for any Hollywood studio. Amazingly, this still puts it only in the top 16 grossers all time. That's about as far as it can get, too, save raiding another film's booty.